Since the 1960s, Keith Sonnier’s work has blurred the boundaries between sculpture, drawing, and technology. Best known for his explorations of the physical and spatial properties of neon, Sonnier creates works that bring together an eclectic array of mixed media materials—from ephemeral materials like satin, latex, and neon to new media such as sound, video, and satellite communication. Keith Sonnier: Until Today, on view from March 15 to June 2, 2019, includes more than thirty key works created between 1967 and 2018, making it the first retrospective to consider the full arc of this artist’s achievement. The exhibition considers the impact of Sonnier’s upbringing in Louisiana’s Acadiana region as well as his expansive travels in Haiti, India, Japan, and beyond, while also exploring the artist’s connection to culture, place, and human communication. These fluorescent light and glass pieces remind me a lot of driving in Louisiana. Coming back late at night, and in the distance seeing a club somewhere in the fog. About the most religious experience I’ve ever had in Louisiana: coming back from a dance late at night and driving over this flat land and, all of a sudden, seeing these waves of light going up and down in this thick fog. Just incredible! Throughout his career, Louisiana served as a key source of inspiration, causing Sonnier to embrace a broad range of cultural references drawn from the state’s unique admixture of African, Caribbean, and European cultures. In 2013, Sonnier cited “the movement of people over the land… [and] the richness of the environment, of the swamps, of the tides, the integration of multiple languages into the architecture and the culture [of Louisiana]” as integral to his artistic development. Trips to Haiti, India, Japan, and Indonesia also enriched his practice. The word Ba-O-Ba, for instance, comes from a Haitian expression for moonlight—a term he adopted because Haiti’s creolized language and culture reminded him so much of Louisiana. Sonnier had grown up around bamboo and sugarcane fields, but while in India, he was intrigued to see these materials employed in new ways, such as scaffolding, where the durable stalks have more of an architectural presence. After observing the Holi festival in India—a celebration where brightly dyed water and powders are thrown into the air, covering streets as well as revelers’ bodies—he began to experiment in new ways with color and pigment. Titling a series of works after Hindu gods such as Kali, Sarasvati, and Ganesh, he sought to express the way that sexuality, art, music, religion, and modern life commingled in the cultures of many of the places to which he traveled, which in turn reminded him of the culture of the place he was from. Sonnier’s work often merges traditional and modern forms—as well as technology and craft—to create a sense of circuitry between different cultures and communities across the world. In the 1970s, he began creating what he called “communication work,” experimenting with new media technologies like radio, satellite, and television, to create works that contemplate the cultural impact of globally networked communication. In 1970, Sonnier created a sound work for the Indian Triennial in New Delhi at which speakers and live microphones positioned within a museum’s archways created a direct flow of communication across the boundaries between indoors and out. This technological theme continued in works such as Quad Scan (1975) which employed a ship-to-shore communication system as a means of broadcasting offshore radio conversations directly into art galleries. In Air to Air (1973) and New York-LA Hookup (1975), he moved past the immediate confines of the art gallery to link art spaces in New York, Los Angeles, and San Francisco via phone and satellite. In 1977, Sonnier created a two-room installation at NOMA in which he placed a Ba-O-Ba neon work created specifically for New Orleans directly alongside a long-distance sound work that brought a live radio transmission into NOMA’s gallery space. Sonnier often fuses neon with more organic materials, producing composites of fluorescence, media hardware, found objects, and organic materials like bamboo, while also incorporating radios and loudspeakers that project radio transmissions and broadcasts in real time. He also works with materials that stand in stark contrast to the sleek, contemporary look and feel of neon, incorporating bamboo and exotic woods like Chinese quince and cedar, or taking inspiration from Chinese calligraphy and pictographic writing. In works such as Propeller Spinner (1990), Sonnier reflects on the discordant communication between generations of information technology, evoking antiquated receivers—once essential for receiving televised transmission in the home—as well as material and immaterial forms such as sound waves, microwaves, and electronic cables. Syzygy Transmitter (1995), for instance, resembles a satellite, positioned high on the wall as if optimally poised to send and receive signals. Works such as Sitting Abri—which takes the form of an elevated hunters’ deer blind rendered in aluminum—reflect the architecture and landscape of Louisiana, as well as older, more ancient forms of communication, evoking the way people once communed across long distances before the advent of satellites, cellphones, and the internet. 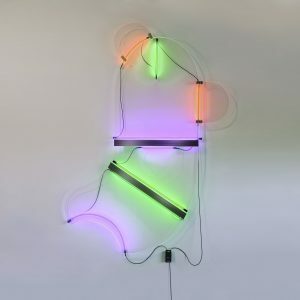 In addition to works in video, neon, and sculpture, Keith Sonnier: Until Today includes the artist’s site-specific installation Fluorescent Room, which was originally exhibited in 1970 and recreated specifically for NOMA in 2011. Created from foam shapes covered in raw, fluorescent pigment, which are black-lit to illuminate the dominant hues of green and orange, this work is deeply informed by Sonnier’s transformative experiences with light and color both at home and abroad. This installation, like so much of Sonnier’s art, seeks to dissolve the boundaries between audience and artwork, material and experience, and culture and place. In works such as Catahoula (1994) and Los La Butte (1990), which signify a return to the aesthetics of Sonnier’s Louisiana upbringing, he integrates “relics” of everyday life—aluminum farm caging, empty plastic bottles of soap, and detritus scavenged from barns throughout his family’s property—with wrapped neon tubing, creating a poetic interplay of light and form, as well as environment, technology, and industry. Incorporating everything from neon and satellites to soap bottles and a hunter’s perch, Sonnier’s art pictures a world in which distances collapse and cultures collide into dizzying arrays of color, light, and form. Keith Sonnier: Until Today explores the artist’s defining role in pushing the boundaries of what constitutes sculpture over the last half-century, as well as the profound way his art engages with the poetics and politics of the information age.